Admit it: You’ve always dreamed of being a farmer. Sim Farm’s pixelated corn fields didn’t quite cut it; Farmville promised action but delivered an endless series of mindless chores. Despair not, would-be agronomist: Soon, you’ll be able to plow fields, sow seeds and whack weeds with the best of them, all from the mud and bug-free comfort of your living room. 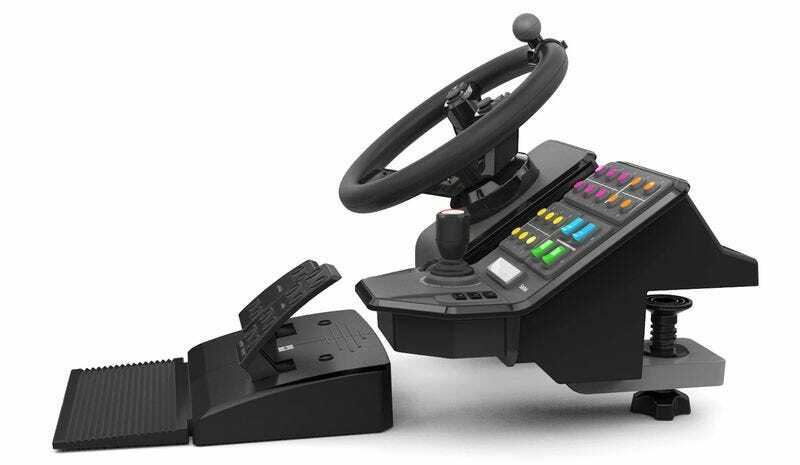 All you need to do is purchase this dedicated tractor controller, designed exclusively for use with Farming Simulator 15 (a game which Polygon describes as the “Steel Battalion of agriculture-oriented gaming experiences.” Yea.) It includes a steering wheel with a turn knob, foot pedals, a vehicle side panel with a loading stick, and 20 programmable buttons. The game is going to start shipping later this year, and you can pre-order an all in-bundle pack now for $299. That may seem like a lot of money to fork over for a single farming simulator, but you shouldn’t let price tags stop you from chasing your dreams.